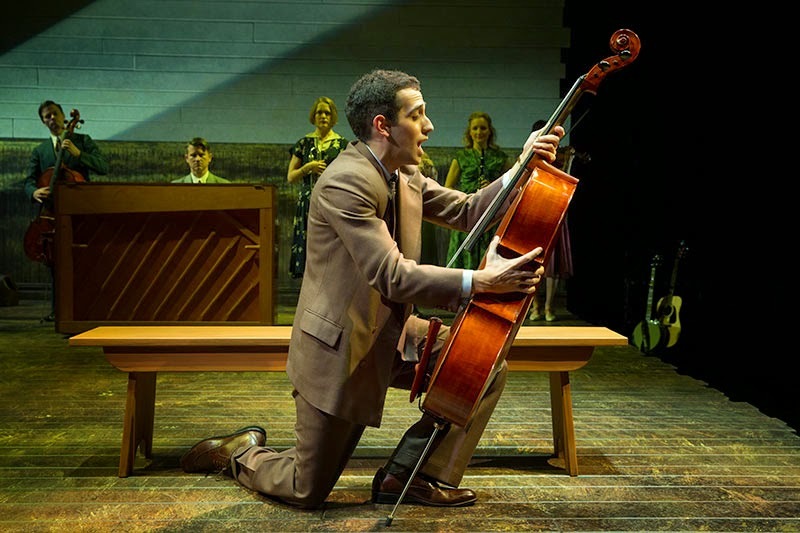 Review of the Friday, November 7 preview performance at Classic Stage Company in New York City. Starring Claybourne Elder, Elizabeth A. Davis, Malcolm Gets, Alma Cuervo and Jessica Tyler Wright. Music by Richard Rodgers. Book and Lyrics by Oscar Hammerstein II. Directed and Designed by John Doyle. 90 minutes with no intermission. Closes December 14. Grade Grid follows the review. 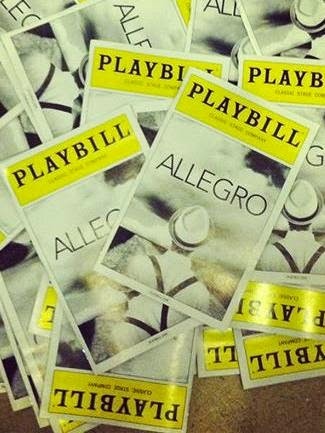 If ever there was a show ahead of its time, it has to have been Rodgers and Hammerstein's Allegro. I can't even imagine the stunned audiences back in 1947. No scenery, adults playing children, the lead actor singing only one solo, while peripheral characters had major numbers. Then three's the (on the surface) simple story of Joe Taylor, Jr., an Everyman, growing up in rural America, moving to the city, only to become disillusioned by love and success. 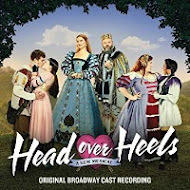 These days, this is the stuff of critical adoration and the kind of show musical theater enthusiasts wish there was more of. 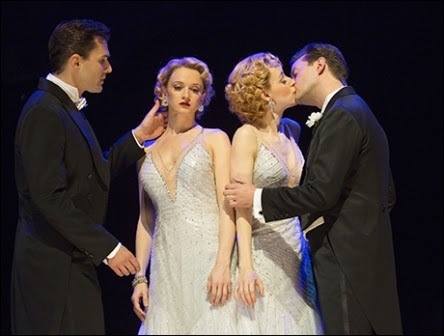 There were many times during this stunning revival at Classic Stage Company that I thought to myself, "this is so modern!" It could have been written today, it feels so fresh. All these years later, it comes as no surprise that Stephen Sondheim was involved with this production - a gofer soaking up all that his mentor, Hammerstein, had to offer. 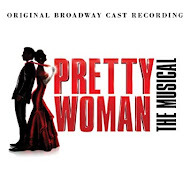 More than a few of the numbers have the feel of a Sondheim show - wry commentary, complex self-evaluative character pieces, an observant chorus, songs stopping and starting throughout scenes. It's a safe bet that he was influenced by Allegro. Some of the modern feel surely comes from the revisions and cuts (the show is now a one act) and the spare, but profound staging by John Doyle. 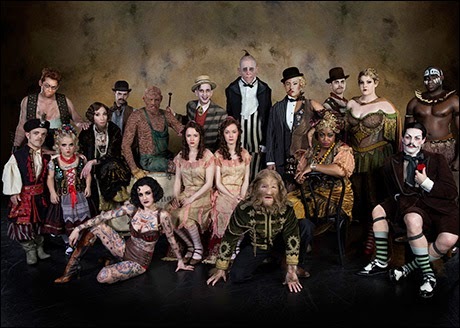 Doyle's signature style of having the actors playing instruments as they act the show is back with this production, yet it never feels stale. It actually adds to both the feeling of small town community and the alienation of big city corporate America, and helps to make the Greek Chorus style of the ensemble make visual and melodic sense. The production also reminded me quite a bit of Our Town, design-wise. 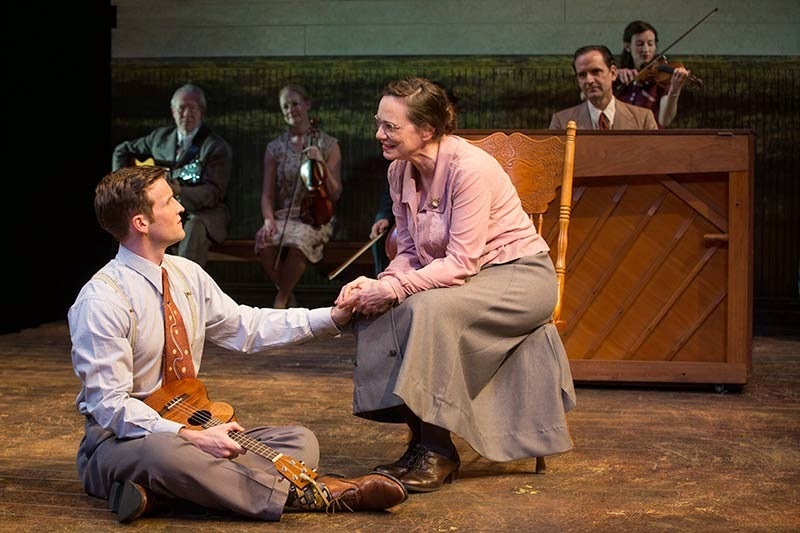 Not only had Doyle relied on scenery consisting of little more than benches, chairs and a piano, but Ann Hould-Ward's one costume per character design and Jane Cox's lighting mix of warm tones and stark whites that reach every corner of the space do much to take us on an easy journey back in time. And yet, with staging and lighting that often includes the audience, there's no mistaking that this is a work with modern (and timeless) implications. The company of actor-singer-musicians is superlative from top to bottom as well. Their work in such numbers as "Allegro," the catchy opener "Joseph Taylor, Jr.," and the charming production of "One Foot, Other Foot" shows off the company's significant gifts and weaves them easily into the fabric of the whole piece. Standouts include George Abud who provides comic relief and an occasional dose of reality as Joe's lifelong friend, Jane Pfitsch as Joe's nurse (her "The Gentleman is a Dope" is a great number), and Alma Cuervo as Joe's wise grandmother-ghost. Her sweet but firm take on "I Know It Can Happen Again," which is heard throughout the show, gives the entire piece an emotional backbone. The principals are also superb. 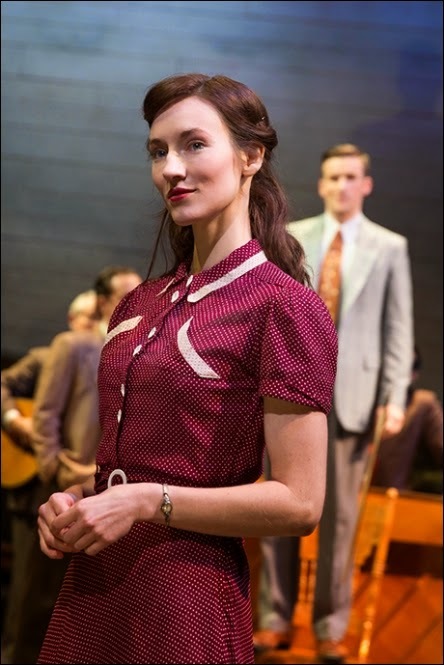 Jessica Tyler Wright strikes the perfect balance of doting wife and protective mother bear, with a lovely voice and striking facial expressions that tell us as much about her character as her spoken words do. 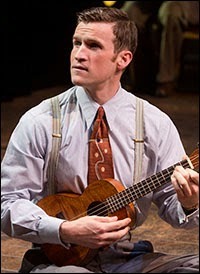 Broadway favorite Malcolm Gets is also doing excellent work as the moody and distant father. But the two central actors in the show are what really propel this into a must-see affair. The delicate look of Tony nominee Elizabeth A. Davis has the perfect way to snare our attention just as her character Jenny as gotten the attention of Joe, but as her detailed performance evolves, she does a remarkable job transforming into someone you'd never expect - Ms. Davis has created a one-woman cautionary tale to be sure! 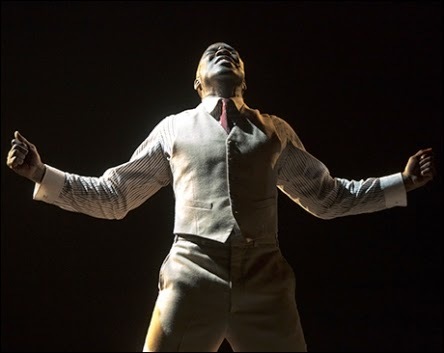 There aren't enough words of praise to heap upon Claybourne Elder, who, with his masterful performance as Joe Taylor, Jr. has surely solidified his place among his generation's finest musical theatre actors. Though he only gets one solo number to show off his significant vocal talents, it is his acting that is thrilling. The physicality of his role - he ages from birth to middle age - must be as exhausting for him as it is mesmerizing to watch. The details of Elder's every move convey the specificity of each stage in the man's life - watching Joe's very first steps is a delight. He also spends a good deal of time observing how everyone else in his life impacts him, and his face portrays a stunning amount of complex emotion. The chemistry between Mr. Elder and Ms. Davis is so real and engaging, you can feel it in your bones. The same could be said for Allegro itself. It is so real and engaging that the time flies by. But even now, nearly two weeks later, the show continues to creep into my thoughts. That kind of staying power is rare in these fast-paced, blink-and-its-gone times. It seems that the times have finally caught up with this gem of a show. 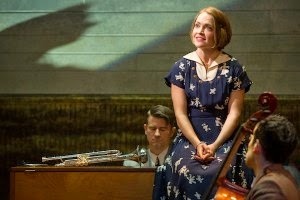 Review of the Saturday, November 8 matinee preview performance at the St. James Theatre in New York City. Starring Emily Padgett, Erin Davie, Ryan Silverman, Matthew Hydzik, David St. Louis and Robert Joy. Special Make-up Design by Dave and Lou Elsey. Illusion Design by Paul Kieve. Choreography by Anthony Van Laast. Direction by Bill Condon. 2 hours 30 minutes, including one intermission. 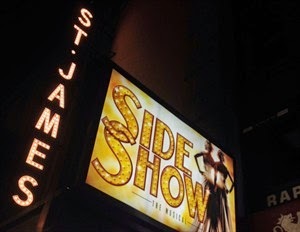 In many ways, the four months since I last visited this "revisal" of Side Show, nothing has really changed all that much. There are no giant cuts or additions or rearrangements of scenes. And while I think it is fair to say that this final version of this piece has not repaired all of its faults - real or perceived, I can say that in a lot of ways, these four months have been well spent by all involved. (My review of the D.C. production HERE.) 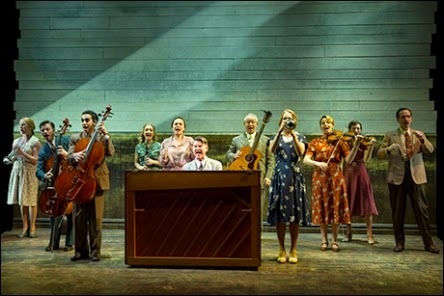 As it stands, the work on the details and tone have paid off handsomely, and what is currently onstage at the St. James Theatre is a mostly engrossing, frequently moving and ultimately thrilling piece. The biggest issue I had with the show during its D.C. tryout, that big flashback scene, remains. Truth be told, it is somehow tighter and more engrossing despite the fact that it pretty much stops the flow of the story. I still think it might have been better placed elsewhere if it must be kept. And I just don't understand why they introduce an element that could have deepened the connection between the twins and the audience - showing us the mind "trick" Harry Houdini teaches the girls - then never address it again. Clearly, the writers feel this is an important event. The show notes in the Playbill even discuss that very thing. It is a frustrating missed opportunity. Even so, it provides some interesting information and sly commentary, and it is beautifully staged. Its theatricality - swirling scenes appear and vanish, the dramatic use of shadows - is visually appealing. Happily, other issues have been addressed even more successfully. The sound (by Peter Hylinski) is as clear as a bell, with the balance between orchestra and onstage company perfectly mixed. Anthony Van Laast's choreography has been polished and heightened. (The addition of more chorus boys makes "Ready to Play" a much more showy and exciting "debut" number for the twins.) Overall, Van Laast and director Bill Condon have sharpened the whole affair, making it more urgent and contemporary while maintaining the authentic period feel of the story. The performances have also become more focused and intense. Time together and the opportunity to perform the show regularly has really made the ensemble gel nicely, as each remains individual and yet seems to be more of a "family." The leading men, who were already doing fine work before, have really brought their A game here, as well. Both Ryan Silverman and Matthew Hydzik have made their characters much more compelling. Their back-to-back numbers have really boosted the entire second half of the show. I'm happy to report that David St. Louis has sharpened and leveled off his take on the protective Jake. He's much less over the top, and his singing is just terrific. "You Should Be Loved" has once again become a highlight. 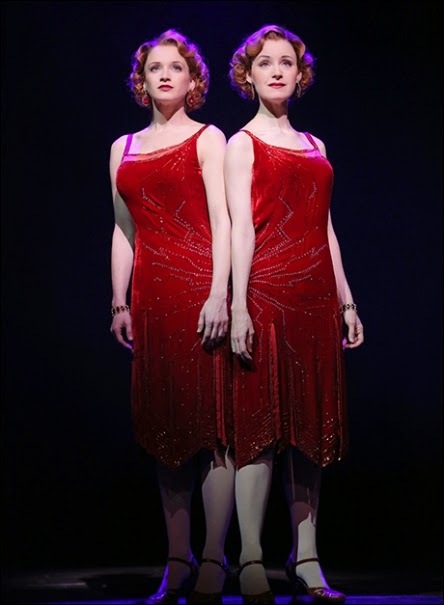 Of course, the best thing about this revival is still the riveting presence of the Hilton sisters as played by Erin Davie and Emily Padgett. It is truly difficult to keep your eyes off of them. Like the rest of the show, they, too, have added much to their already amazing performances, with even more small details that work to show them off as singular girls and a by-necessity remarkable whole with a special bond. I especially appreciate that they both (and their director) have taken great care to remain true to the period and spirit of the show by not succumbing to the easy temptation of modernizing their vocals. They are appropriately show-bizzy in their vaudeville numbers, introspective in their "story numbers," and belt out their big ballads with an old-fashioned sincerity. Both "Who Will Love Me As I Am?" and "I Will Never Leave You" benefit from powerful, heartfelt renditions rather than the more obvious histrionic belting so en vogue these days. The songs and the ladies who sing them stop the show. I'd love to be able to say that I've completely forgotten the original production, still an all-time favorite of mine. Shows that are more conceptual and raw will always appeal to me more than more literally told tales. But I love this version in ways that I didn't expect I ever would or could. To me, that is what going to the theatre is all about. 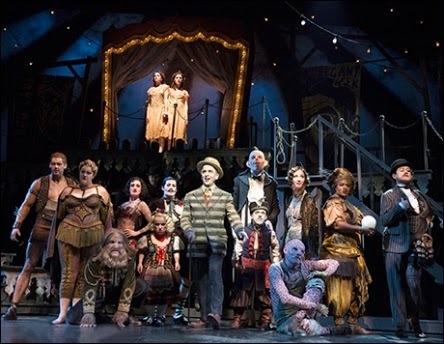 Don't forget to vote in this week's HOT or NOT poll, featuring the cast of Side Show! The season is really heating up now! 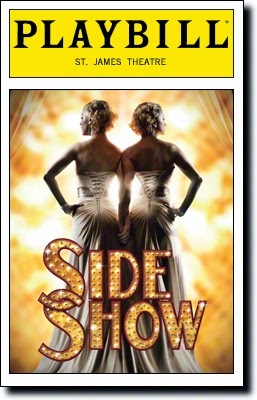 This week, the latest revival to open, Side Show, is ready for your HOT or NOT votes! So far you've selected the finalists for this year's competition for the Holler If You Hear Me, On the Town and The Last Ship. To see who you voted for, go to the "Hot or Not" tab at the top of the page!) Some of this week's cast members may be difficult to recognize without their special side show make-up, but have no fear, I've included their character names with their head shots. So who among them is the hottest of the hot or the nottest of the not? Your votes decide! For the 2014 - 2015 season, I've made a change to the way things will be done, and I hope they make it even easier for you to cast your vote! As you consider each cast member, all you need to do is click either "HOT" or "NOT". That is it! Of course, what you think is hot or not is up to you. Is it all just about looks? Or is it also about talent? Performance? Potential? To me, it's probably all of these things combined. BUT THIS IS ALL UP TO YOU! The top "HOT" vote-getters in each category will move on to the end-of-the-year finals. (In categories where there is only one potential finalist, they will only go on if they receive more "HOT" votes than "NOT" votes.) 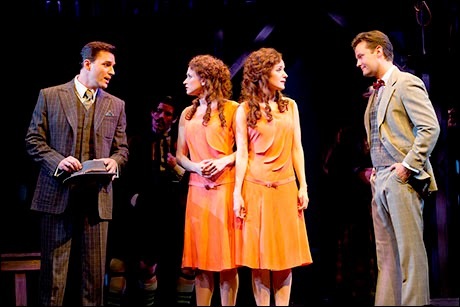 In May 2015, together we will decide who is in THE HOTTEST BROADWAY MUSICAL CAST OF 2014 - 2015! I've included a few pictures below so you can see them in action. Below the pictures is a hyperlink for you to click. A pop-up window with the poll in it will appear. After the introduction, click "START SURVEY," cast your votes (there are pictures of each cast member there), and be sure to click "FINISH SURVEY " to make your votes count. THIS POLL WILL CLOSE AT 6PM ON FRIDAY, NOVEMBER 21! CLICK THE HYPERLINK BELOW TO VOTE! Review of the Sunday, November 9th performance at the Belasco Theatre in New York City. 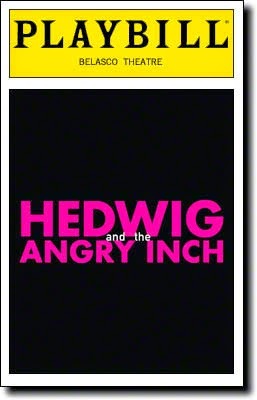 Starring Michael C. Hall and Lena Hall. Musical Staging by Spencer Liff. Direction by Michael Mayer. 100 minutes, no intermission. Check out the JKTS Grade Grid after the review! It was recently announced that Michael C. Hall has extended his run in Hedwig and the Angry Inch by an additional two weeks. After having seen the show this past weekend, I must urge you strongly to take advantage of those extra chances to see one of the most electrifying performances currently on Broadway. I won't waste your time discussing the physical production or the direction, as I've pretty much said it all in my two previous reviews of the show (click the links to your left to see those). Instead, let me share a few a few thoughts on the cast. Maybe it's that this was my third time, but I really noticed The Angry Inch's part in all of the show. Though mostly silent, and mostly concentrating on the music, these guys have developed nicely individualized characters. 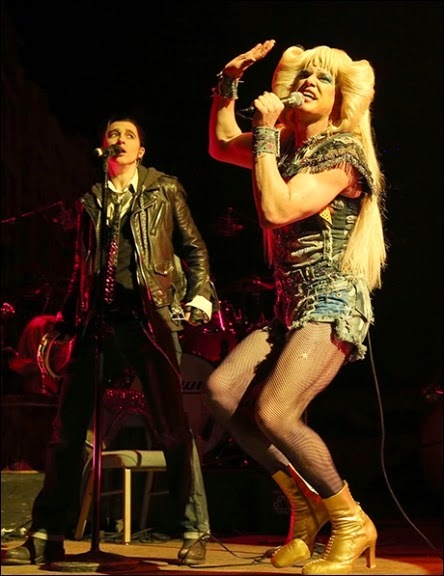 When you go, notice the interplay between them, and how they react and respond to Hedwig - and how compelling their wordless but palpable relationship is with Yitzhak. And so, kudos to Justin Craig, Matt Duncan, Tim Mislock and Peter Yanowitz, four amazing musicians and pretty decent actors, too. I am thrilled to find that not only is Tony winner Lena Hall as enticing and exciting as ever, but she has also grown in her role, plumbing it for new depth and nuance. Her vocals remain gritty and jaw-dropping - her range is incredible. But there is also a more clear sense of a power struggle between Yitzhak and Hedwig, not just in the obvious parts of the plot, but in the more subversive give and take, love and hate between the two. Her blocking has not changed, and yet every move Ms. Hall makes seems to have taken on new purpose. It feels like she is, at last, not second banana to a force of entertainment nature, but rather a significant partner and adversary rolled into one. This is an important and very gratifying turn of events, born out of necessity in being paired with a much deeper performer these days. I'm not knocking the much revered performance of Mr. Harris (I did not see Mr. Rannells), as it was a valid, if very "Broadway" performance in that I'll-do-everything-I-can-to-give-the-audience-exactly-what-they-want-in-a-musical way. As I mentioned in both of my reviews of the original star, I never felt like I was seeing a different character, but rather a Tony host in Farrah wig and a spotty-at-best German accent. Charisma made that performance and the show accessible to the most standard of Broadway fans. Michael C. Hall, in my opinion, is a vastly better actor to begin with, and man of wide-ranging abilities, whose body of work reveals a daring performer who manages to make even throw away lines significant. Here, it is obvious that the man belongs on a stage, feeding off the thrill of live performing - a trait he shares with the character he's playing. But the real thrill of this magnetic and impressive performance, for me, is in the details. 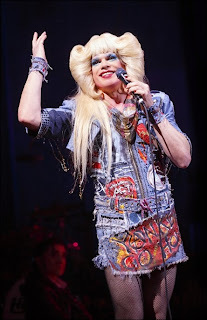 Hall does not aim to please every second of the show - he ebbs and flows just as Hedwig herself does, indulging in selfish moments as often as giving ones. He has also given much more emotional weight to every choice he makes. These aren't just clever word play and pithy commentary bits. Even as she tries to hide her feelings with self-deprecating humor, or when she indulges in moments of self-pity and self-loathing, Hall makes sure that Hedwig's immense sadness and startling signs of optimism are never far from the surface. There's calm and there's anger; there's epiphany and sacrifice. With Mr. Hall's brilliant interpretation and Ms. Hall's continued evolution in a career-defining star turn, there's a Hedwig that is as entertaining as ever, but also a more compelling, satisfyingly complete musical. At last, I can see what all the fuss is about and why this is, as advertised, an important piece of art.